Welcome to our new website. I hope you find it useful, whether you are a prospective pupil or parent, or a visitor interested in us. New Era Senior Secondary School was formed in 1991 under the banner of The Gujarat New Era Education Trust. It is a well established school for age group from 3+ to 17+. 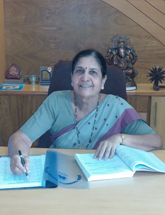 NESSS has been at the heart of Vadodara for more than 23 years, and has had a wonderful reputation for excellence since its foundation. Today, we are a thriving, independent, co-educational school, with high academic standards a wide range of curricular, sporting, cultural and outward bound opportunities. We believe in adding global dimension to curriculum and are proud recipient of International School Award (ISA). We were awarded ISA consecutively thrice. As a part of our initiative to add global dimensions, we looked for global partners and we have 3 schools in the U.K. and two schools in Sweden as our partner schools. Our teachers have been to their schools and their teachers have visited our schools. Our educational facilities are among the best in India. Our aim is to establish a strong foundation for children's future schooling. We work closely with parents to ensure that their child's individual needs are identified and met. For day-to-day purposes the pre-school is independent of the Senior School but the close proximity gives the pre-school access to excellent support and facilities. As the children move from pre–school, they enter the Senior School in a smooth transition. We take great pride in the quality of the relationships between pupils and staff. Our pupils are from a variety of backgrounds. New Era Senior Secondary School is, however, impossible to describe in just pictures and words. If you are looking for an exciting, stimulating school for your son or daughter that offers strong academic base, great sporting and extra-curricular activities, please do come to visit us. I will be delighted to show you around, introduce you to some of our staff and pupils, and let you see for yourself what a wonderful school we have. I am confident that you will be impressed. Do come along to visit us and I would also be able to meet you on working Mondays, Wednesdays and Fridays.